Due to great demand for more pictures, we have added some dedicated pages to The Saner Container with just pictures of container modification kits by clicking here. You can find them under Modifications on our website. When you go there, you can also see our Custom Modifications and Industrial Modifications. 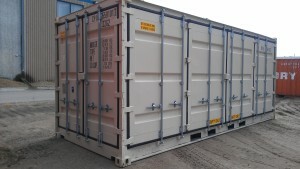 Our Container heading will bring you to the different size and condition containers we have as well as specialized containers and check out our delivery requirements and a video of a container being set down. Did we miss something container-related you wanted to see? Please let us know. Please note this page was updated to link to our updated website.